This excellent picture is part of the Geograph website, which collects images from grid squares across the UK. 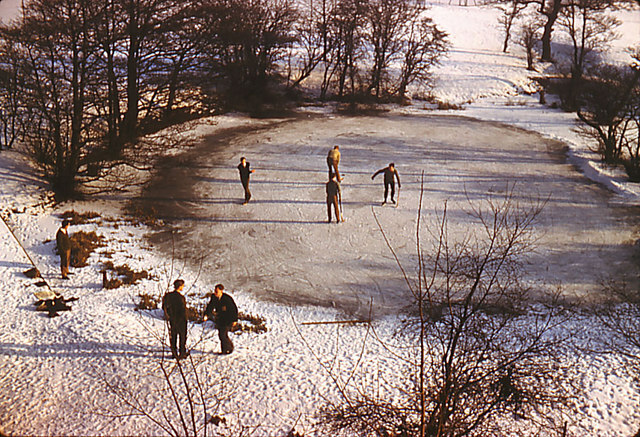 It and its neighbours can be found here – the caption reads ‘Edge Hill College pond skaters -Taken from hall of residence, Lancashire Hall, now demolished, in the severe winter of 1962/3’ and it was submitted by a ‘Chris Coleman’ – obviously taking an interest in Edge Hill students at a very early age! This entry was posted in Edge Hill and tagged Edge Hill, lancashire hall, lancs hall by Roy Bayfield. Bookmark the permalink.